Today I will be featuring a luxury accommodation provider, The Conrad Maldives Rangali Island Resort which houses 79 beach villas, 50 water villas and 21 spa villas with private treatment rooms, spoiling travellers with choices of different breathtaking scenery options. 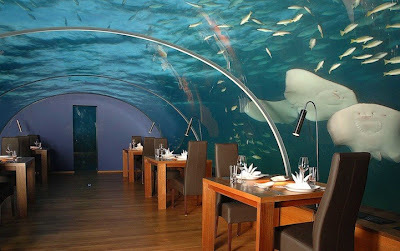 What makes the resort special is, it also offers a dining space that is declared the world's first all-glass undersea restaurant. The Ithaa Undersea Restaurant is built 16 feet below sea level and serves exclusive European and Maldivian-Western fusion cuisine. 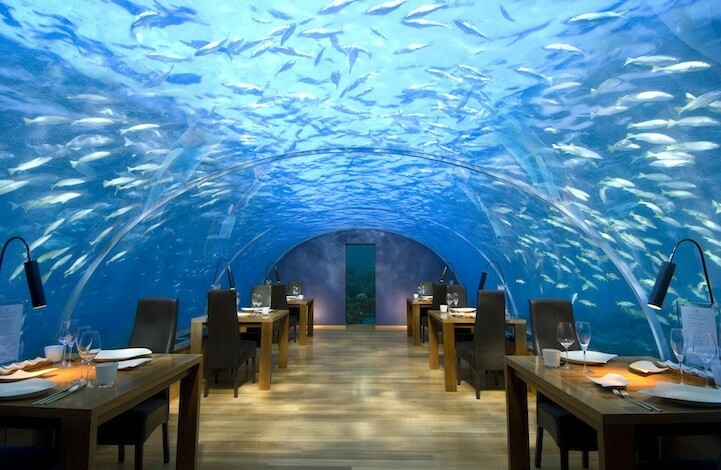 Diners will be impressed with the exclusivity this restaurant provides. In fact, advance booking up to 14 days prior to arrival is highly encouraged as only 12 people can be accommodated at one time and children under the age of 12 are not allowed to ensure that everyone gets to enjoy their meal in an unforgettable atmosphere. More impressively, the resort has thoughtfully allow the restaurant space to be converted into a private bedroom suite for two during special occasions. Quite a perfect location for weddings and honeymoons. If not, the resort is also great for a holiday get away as there are countless of activities to engage in. Maldives have been well known for its clear turquoise waters which makes it an ideal location for water sports such as snorkelling, windsurfing, scuba diving and canoeing. The resort also organizes mini-submarine rides for 2 passengers, in a 30-minute interval. Hotel rates start from US$815 per night, per couple. Nice Luxury travel blog, CONGRATS! Let me know if you could be interested on adding your luxury properties with us! We own a modern online magazine where you can read genuine travel experiences and discover our outstanding portfolio of villas in over 100 destinations. Do not hesitate to contact me at media@eatsandretreats.com if you need further information about us. I visited Maldive during by Indian tour but I never seen it's underwater hotel. After seeing above pictures I realized that I missed something. 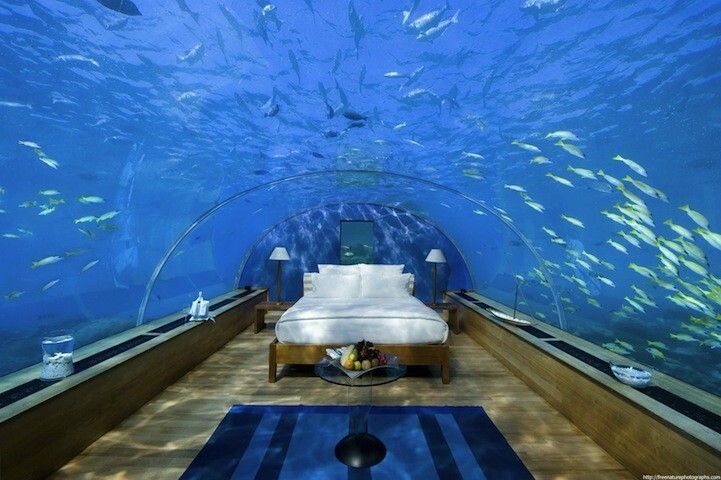 I will defiantly visit this underwater hotel in my next trip. Wow it's look like a magical place. You got really great shots. We invite to discover Portico Club is the premier provider of Luxury Hotels and Resort Worldwide. Fantastic article.. really very very appreciable! Really a good deal for living in a luxury hotel, I think this should be deal for those who want to spend there time in an villa or who are searching for best place for there holidays....Thanks Great share! 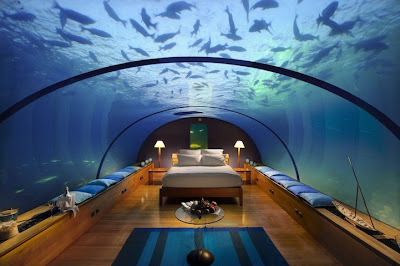 I really like the scene underwater,If you are looking for a perfect Hotel vacation then Maldives Underwater Hotel Room will be your definite choice. if you are searching for a beautiful and stable hotel in paris ,.The Grand Hôtel du Palais Royal offer you for best place for living. This place is truly amazing! I'm already started to search for this place. here is another good read on the subject.